Alex DeBrincat scored a hat trick as part of a five-point night to lead the Chicago Blackhawks to a wild 8-7 win over the visiting Ottawa Senators on Monday. The offensive barrage started early, as the teams combined for nine goals in the first period. It was the highest-scoring frame in the NHL this season, and the 12th-highest scoring period in league history. Starting goalies Collin Delia of Chicago (three goals on 10 shots) and Anders Nilsson of Ottawa (four goals on 12 shots) were both pulled before the first period was complete. 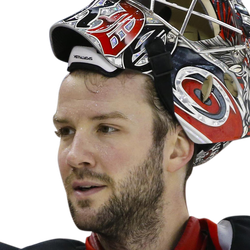 The Blackhawks' Cam Ward and the Senators' Craig Anderson stepped between the pipes for their teams, with Ward stopping 24 of 28 shots to earn his sixth win in his past seven games. DeBrincat scored twice within a 73-second span in the first period, then found the net again 8:19 into the second period for his 32nd goal of the season. The second-year forward also collected two assists, giving him a career-best five points in a single game. Chicago's Patrick Kane recorded a goal and two assists to extend his points streak to 18 games, the longest streak by an NHL player this season. It was also Kane's 17th straight game with at least one assist, tying him with Wayne Gretzky and Paul Coffey for the third-longest assists streak in NHL history. Dylan Strome had a goal and two assists for Chicago. Brandon Saad and Jonathan Toews each had a goal and an assist, Gustav Forsling also scored for the Blackhawks, and Duncan Keith had a two-assist night. Colin White and Thomas Chabot each scored twice for the Senators, with White also recording an assist for a team-leading three points. Mark Stone had a goal and an assist, Bobby Ryan and Rudolfs Balcers produced a goal apiece, and Matt Duchene and Brady Tkachuk each contributed two helpers. Anderson made 26 saves on the 30 shots he faced. Defenseman Brent Seabrook wasn't in Chicago's lineup due to an abdominal injury. The Blackhawks won for the ninth time in their past 11 games. Chicago has now won its past five meetings with Ottawa, and the Blackhawks improved to 14-3-1 against the Senators since 2007.